President Uhuru Kenyatta and Somalia President Mohamed Farmaajo on Wednesday held a meeting over the Indian Ocean boundary dispute. The meeting was chaired by Ethiopia’s Prime Minister Abiy Ahmed in Nairobi. In a Tweet after the meeting, Abiy said both countries have agreed to work towards peace and to take measures in addressing issues that escalated the tensions. 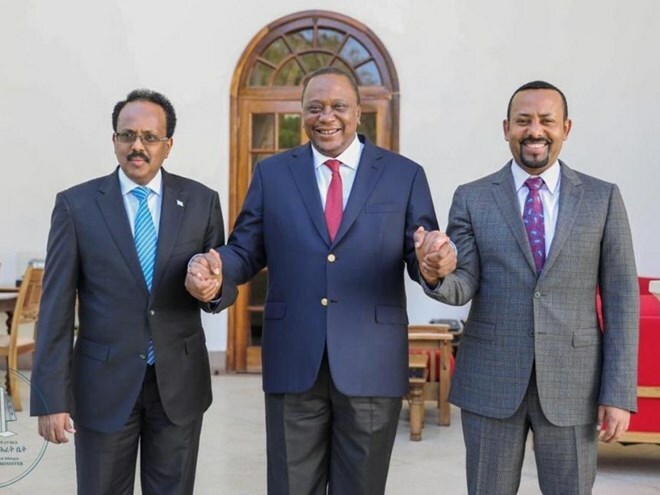 Abiy last week held a raft of shuttle diplomatic meetings separately with presidents Uhuru and Farmaajo. Uhuru was on Mar 1-2 invited for a two-day visit in Addis Ababa, where, together with his host, attended the Ethiopia-Kenya trade and investment forum and the inauguration of Debre Birhan Industrial Park. “I joined Prime Minister Abiy Ahmed Ali of Ethiopia for the official opening of a two-day Kenya-Ethiopia high-level trade forum in Addis Ababa, Ethiopia. We made a commitment to deepen trade and economic ties between our two countries,” Uhuru said on Friday. On Tuesday, PM Abiy received President Farmaajo for a one-day official visit. “The two parties are expected to continue discussions of key regional and bilateral issues of mutual interest, following similar talks with other Horn region countries,” the Office of the Prime Minister said. “PM Abiy Ahmed held bilateral discussions with the Somali President @M_Farmaajo at his office today. The discussions focused on four key issues including the i) strengthening of regional peace & security per the agreements signed previously… (ii) mechanisms to ensure Kenya-Somali relations are strengthened; iii) continuation of joint port development; and iv) ensuring that relations with b/n the administration of Somaliland & Somalia is in support of regional peace,” PM Ethiopia tweeted. On February 16, Foreign Affairs PS Macharia Kamau in strongly worded statement summoned Kenya’s ambassador to Somalia Lt-Gen Luca Tumbo, and sent for consultations Somalia’s envoy Mohamud Ahmed Nur, claiming Mogadishu had auctioned Kenya’s oil blocks in London. On February 21, the Kenyan government through Foreign Affairs CS Monica Juma said it will not cede an inch of its soil in the disputed maritime border with Somalia, even as it affirmed it is committed to a peaceful resolution of the row. In response, the Ministry of Foreign Affairs of Somalia in a letter dated February 25, the country rejected Juma’s characterisation of the maritime dispute and told Kenya the case will be decided by International Court Of Justice. It urged both sides to refrain from action that may aggravate the dispute. Kenya prefers negotiations instead of the court process. “Do you take your friend to court? It is better to discuss,” PS Kamau told the Star in a past interview.